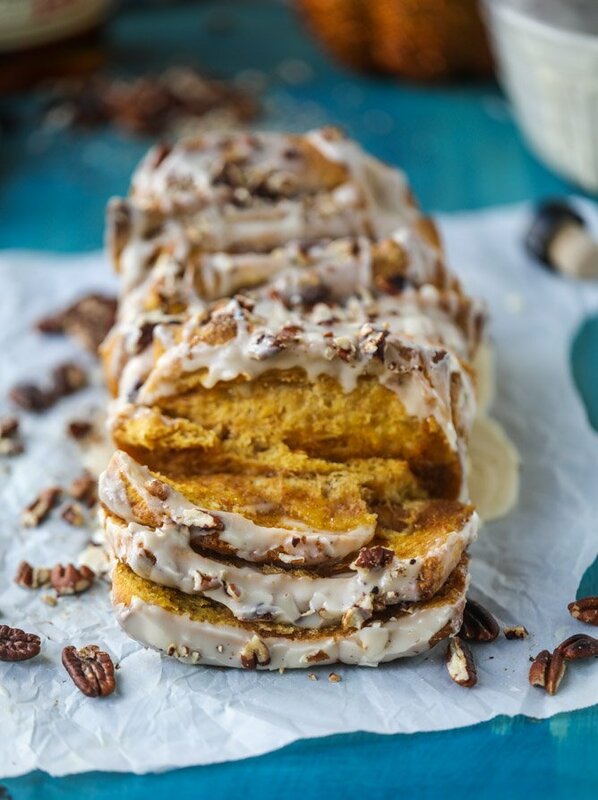 Pumpkin, Bourbon Cream and Toasted Pecan Pull Apart Bread. I’m on a pull-apart bread rampage! And maybe a pumpkin rampage. 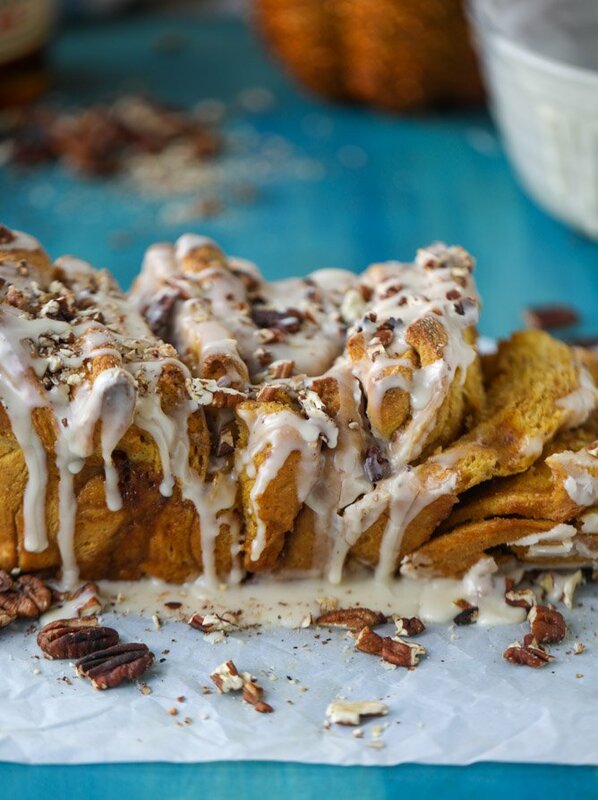 And therefore, a pumpkin pull apart bread rampage. Guys, what is so funny about this is that I could care less about pecans. Pumpkin in sweet dishes is so overdone. But this combo with the bourbon cream icing? I am just completely over. Done for. Should not exist anymore. This is one of my favorite things to eat now. Forever! A few weeks ago, when I shared this roasted garlic pull apart bread, I told you that I’d made three breads for the upcoming seasons. I have no idea why pull apart bread is SO good, why it’s so much more satisfying than say, making a quick bread or muffins or something with the same flavor combo. Maybe it’s because you know the work that goes into it so you’re really going to enjoy the heck out of it? This bourbon cream icing. What the heck. I could seriously drink it. I’m completely infatuated. Not sure there is much else to say about it. Now here’s some good news! You can make this a little bit ahead of time. When I say “ahead of time,” I mean that you could make it the night before and serve it for breakfast or brunch the next day. Or you could make it the morning of and serve it for dinner that night. In both cases, I’d wait to glaze it until right before serving. Also! It would probably make a delish holiday breakfast, but I have a major question for you. Do you guys eat big, huge holiday breakfasts?! In our family, dinners have always reigned supreme. Like Thanksgiving dinner, Christmas Eve dinner, Chrstmas Day dinner. It’s when all those spectacular, traditional dishes that we look forward to all year get to shine. And at the same time, I hear SO often that a lot of you guys have Thanksgiving morning brunches or Christmas morning brunches and it sounds like it’s in addition to the dinners! I just can’t imagine these two huge meals on those days. What are your thoughts? Because secretly, I’d love to do both. But I’d be afraid that when the dinner rolled around, no one would have any room to eat! And I mean, dessert? Heck, would it even be worth it? With this bread though, it might not be a problem. I mean, I’m pretty sure I’d always have room for this loaf of deliciousness. Place the milk and butter in a small saucepan and heat over low heat just until the butter melts. Remove from the stovetop and let sit for 2 to 3 minutes, then stir in the water and vanilla extract. With the dough hook attached to your mixer, stir in the milk and butter mixture until combined. Add the salt and the pumpkin puree, beating well after each addition. Beat in the spices. The dough will be very sticky! Add the remaining 1 cup flour gradually, beating for another 2 to 3 minutes until the dough comes together again. It should still be very sticky. Place it in a well oiled bowl and cover with a towel. Let it rise in a warm place for 1 hour. After one hour, punch the dough down and turn it out on a floured surface. Roll it into a large rectangle, about 12×20 inches if possible. Add the filling: whisk together the melted butter and pumpkin. 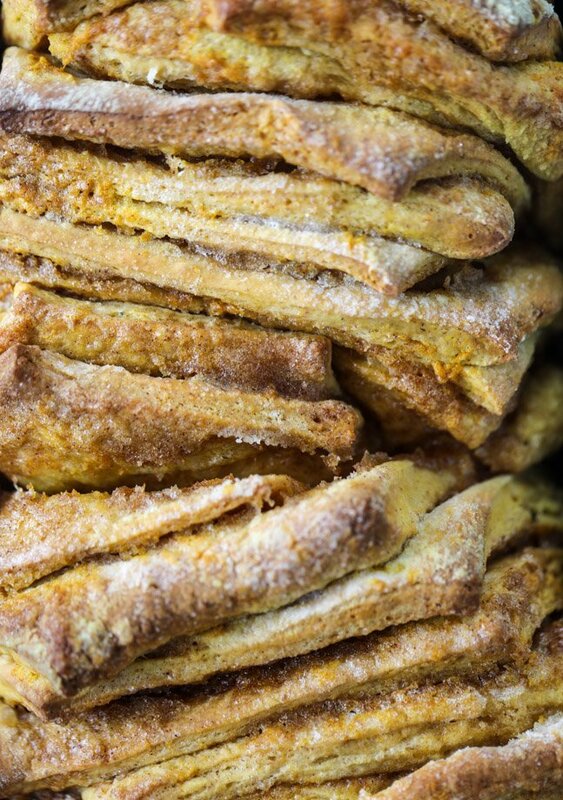 Brush the dough with the melted butter pumpkin mixture, cover with the sugar and cinnamon. Use a pizza cutter to slice the dough into 5 strips from top to bottom – lengthwise. Stack the 5 strips together, then cut them into 6 sets of squares. Preheat the oven to 350 degrees F. Place the pan in the oven and bake the bread for 35 to 40 minutes, until the top is golden brown and set. Remove and let cool for 10 minutes, then gently turn the bread out onto a flat surface. 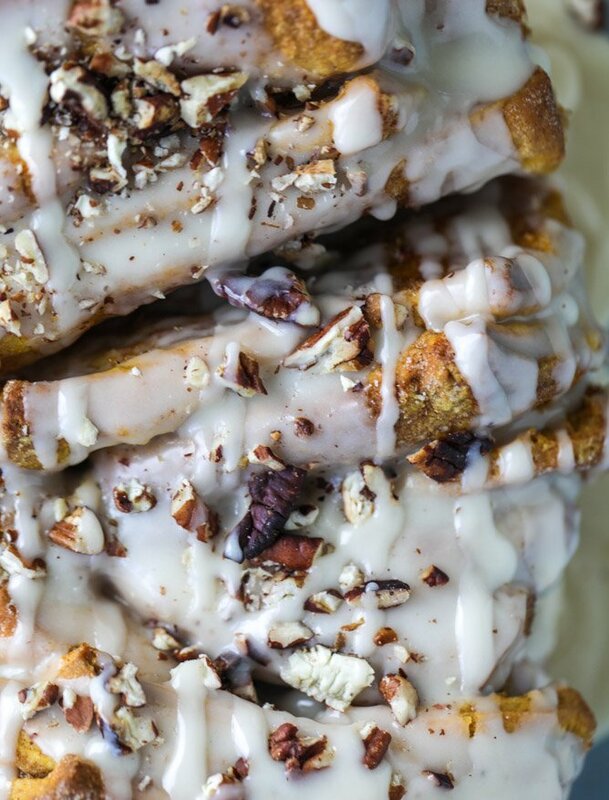 Cover with the bourbon icing and pecans and serve immediately! To toast the pecans (you can totally do this ahead of time, like a day or two), add the pecans to a nonstick skillet over medium heat. Stir and toss occasionally for 5 to 6 minutes until the pecans and golden and fragrant. Remove the pecans and place them on a cutting board. Chop the pecans coarsely before sprinkling them over the bread. Now these flavors could be my last meal. So here’s the thing. My family does a big dinner for every holiday, but it is not at normal, every day dinner time. It is always, always in the middle afternoon. Like 4pm at the absolute latest, but sometimes as early as noon. And it is always “Thanksgiving dinner” or “Christmas dinner” no matter what time it’s being served. I’ve thought about trying to add a (festive, but lighter) breakfast/brunch, but it just hasn’t worked out yet. I actually think my ideal would be brunch at 10ish, gifts (for Christmas, obviously), lounging around for a few hours, then last minute prep and dinner at 6ish. Oh my gosh. I have never made pull-apart bread before but you’ve convinced me. This looks incredible. Because of the big Christmas dinner we rarely have dessert afterwards – maaaaybe some coffee and a few cookies or other sweets that are in the fridge, but I don’t think we purposefully plan a Christmas dessert. 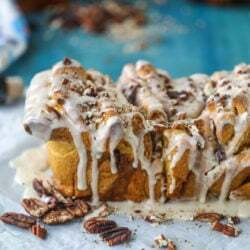 Instead, we’ve had something sweet and dessert-like for Christmas breakfast – cinnamon buns for years and last year I made a panettone bread pudding – with mimosas while opening stockings, then nothing for lunch and an early dinner. When your kids get up early for gifts on Christmas morning, you are hungry for breakfast at 8:30/9am! At least in my house. We do a blueberry french toast bake, so I make it the night before. Then pop it in the oven that morning right when I get up. We have that with bacon. Then just snacks like veggies, chips and dip, relish tray (bloody mary’s) during the day. Then everyone is hungry for a big dinner by 5:30/6. :-) I make it a point to truly enjoy everything I eat on Christmas…it only comes once a year! that doesn’t seem too overwhelming though!! it sounds like the perfect day to me. 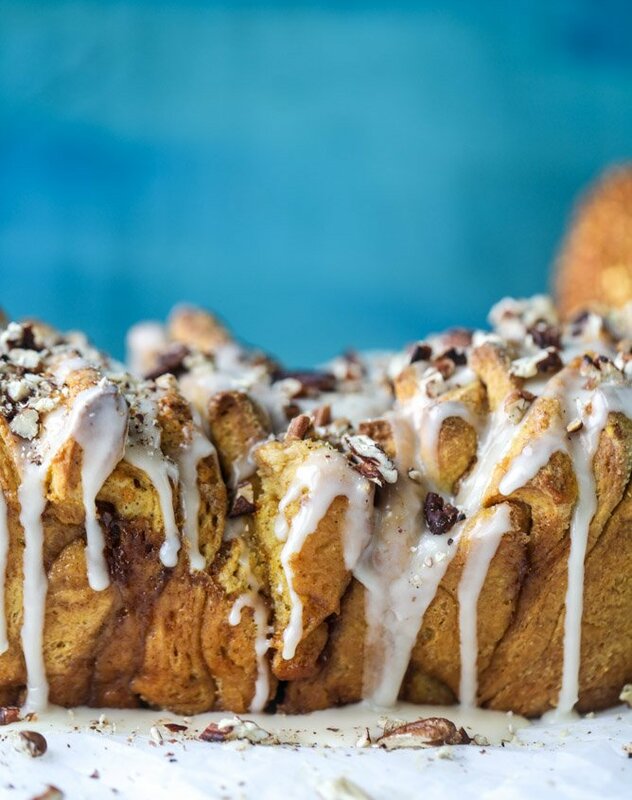 Pull apart bread is one of my favorite treats. I love how tactile it is! I want to pull apart and devour this whole loaf! And I hear you about the Holiday breakfasts. We never did that in my house – just regular “light” things like yogurt, fruit, muffins. Certainly wouldn’t want to risk filling up before the main meal comes! Enjoy your weekend, Jess! First, holy cow. Jaw dropped. This bread. I cant. Second: my family does brunch on thanksgiving like pumpkin waffles or something. And for Christmas we basically eat for 2 days. Christmas Eve we have normal breakfast but lbh: it’s normally Christmas cookies. Then my husband, daughter and I have seafood linner (lunch/dinner) around 4. After church we have appetizers and snacks at my dads which normally involves taquitos and pizza and cookies and pub cheese so basically all the things while we open presents. Then Christmas morning we do cinnamon rolls or French toast casserole and then either a stuffed flank steak or turkey dinner. In between there is more pub cheese and appetizers. As I type this out I’m realizing how obscene this is but this is how it’s been since I was little. christmas cookies for breakfast, yes that is usually us too. IT SOUNDS AMAZING NOT OBSCENE. hahahaha love that way of thinking. 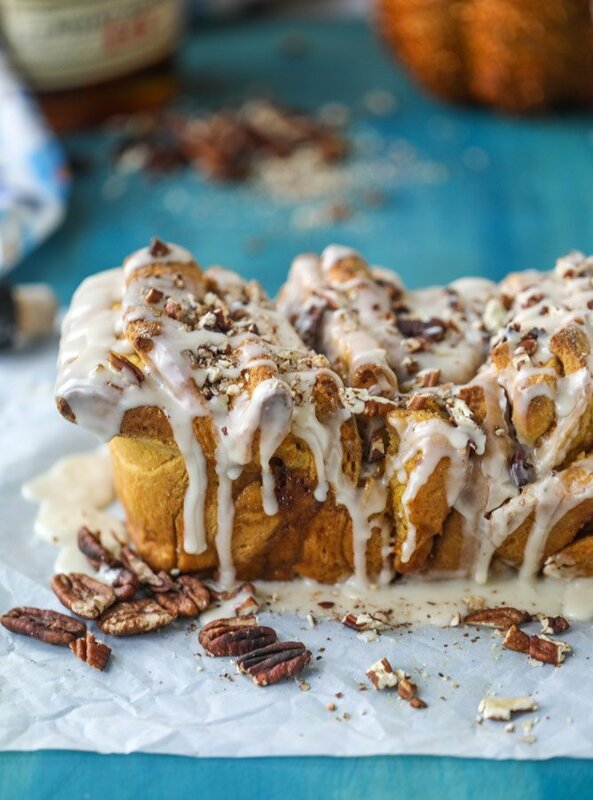 I’ve never made pull apart bread before but I think I need this in my life! Wow! One question, my husband is 16 years sober. Does the bourbon cook out? If not, what do you recommend for frosting? hi! congrats to your husband, that is wonderful. this bourbon does cook out but if you want to swap it, you totally can! 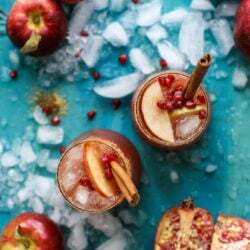 you can use milk or water or even something like cider if you want a fall flavor! Oh my friend, you are missing out on a key ingredient, did you know there is an actual bourbon cream!? It’s my husbands favorite. It’s made by Buffalo Trace. There are other imitators, but this stuff is the real deal. Good for sipping, but would be an amazing add to the glaze! I NEED THIS!!! getting it as soon as the baby is born. Oh my gosh! This bread! I need it!!!! For the holidays breakfast and lunch have always been our things. We have pancakes or bacon and eggs and fruit while opening presents then a big BIG lunch with all the fixings and multiple desserts somewhere between 1-3 and then dinner if anyone can move/is still hungry is leftovers. interesting!! i do love this idea because then you don’t feel like you’re gonna die when you lie down after that huge meal, haha. 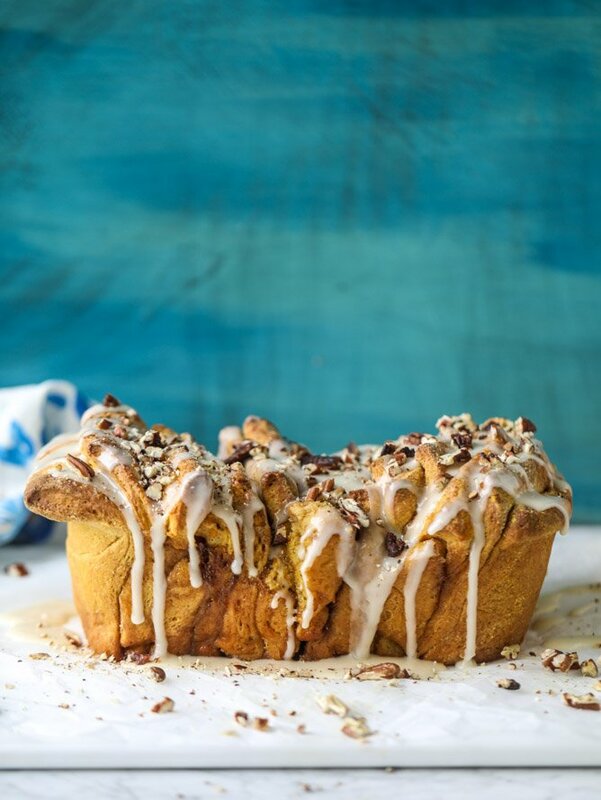 I’ve never made a pull apart bread but they look so FUN that I might have to give it a go. Also, bourbon cream icing? I want to drink it. Thanksgiving is always lunch for us (followed with leftovers whenever we get hungry again for dinner). And Christmas is a lot. It’s always a big breakfast between 9 and 10 with my grandma’s insane egg casserole (topped with breadcrumbs… idk but it’s straight magic) and French toast casserole, plus fruit and toast and the like, and then we have cookies when we need sustenance before a big dinner around 4. Followed by more cookies because CHRISTMAS. Umm, yum! Could the milk be replaced with whipping cream? Excited to make this for my hubs when he comes home next weekend. in the bread recipe? i’ve never tried it… i’m not sure if it would work with the dough. if it’s all you have on hand, i think i’d do half cream, half water! I was feeling lazy when I made this so I did more of a monkey bread-style setup, instead of pull apart bread. Either way, delicious and made my apartment smell like fall. Thanks Jess! so glad you liked it! xoxo thanks kimberly! 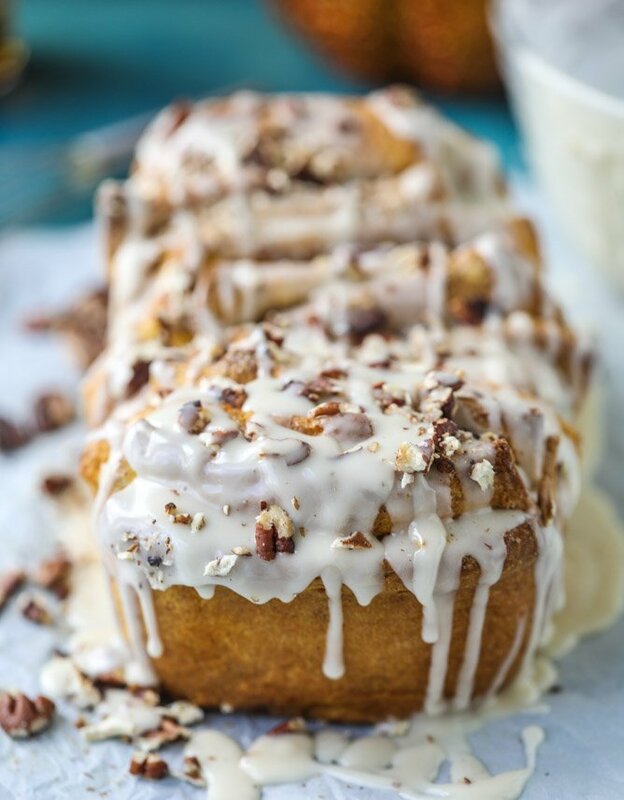 I always make cinnamon rolls for Christmas morning, but guess what I’ll be making THIS year! This is incredible, Jessica. Incredible. Holidays for us are a big (healthy) breakfast and then big (likely unhealthy) dinner. No lunch. Gotta rest the stomach. OK, I’m not going to wait until a holiday to try this. It’s going to be cool and rainy this weekend. Sounds like a perfect time to bake something very fall-like. Can’t wait to make it! Could this be made ahead and frozen? Or would that ruin it? So excited to try it!